Rent your Ringtool! 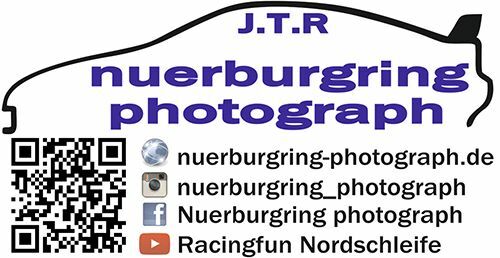 Rent4Ring - the best rental cars at the Nürburgring Nordschleife! Trackdays & "Touristenfahrten" We offer the perfect rental race car for the old Northloop. the best rental cars at the Nürburgring Nordschleife! We offer the perfect rental race car for public driving session on the old Northloop. 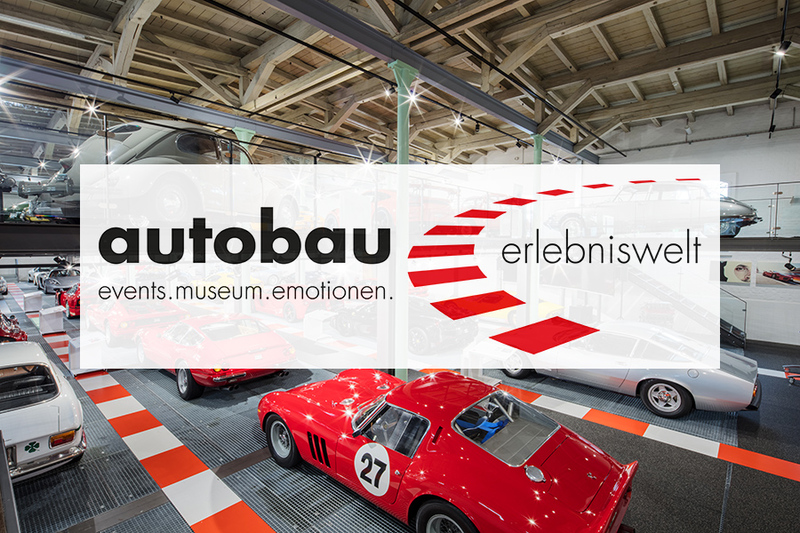 Whether it's Touristenfahrten or your next Track Day at the Nordschleife, we can help! We aim to exceed your expectations and to make your time with Rent4Ring race car rentals the best experience possible. Rent a racecar from us and you will have the time of your life! We want to make your trip to the Nurburgring a time to remember! We can also assist with recommendations for hotel bookings, airport pickups, dining, Nurburgring Nordschleife driving coaches and everything else you can think of. For a full decade, we offer the perfect Rental Cars for any kind of Driving Experience on the Nürburgring Nothloop. Whether it is Touristenfahrten or your next Trackday at the Nürburgring, we can help! We aim to exceed your expectation and to make your time with any of our Rent4Ring Race Car Rentals the best experience possible. Rent a Race Car from us, and you will have the time of your life! We are going to make your trip to the Nürburgring a time to remember. We also can assist with recommendations for Hotels, Airport Collections, Dining and of course Nürburgring Guidance. Everything you need to know about the Nordschleife! How and when can I drive the Nürburgring Nordschleife? The Nürburgring Nordschleife opens regularly for public driving sesssions. Normally these are weekday evenings and all day on Sundays and holidays. In addition to these public sessions for normal traffic, there are also private trackdays. These are private events, open to limited numbers. Typically you will find one or two events per month throughout the season. If you can't see the day you want to drive in the list of public openings, then it's not open to the public on that day. If you're looking for a date in a long time in advance and that whole month shows no opening times, then it hasn't been published yet. Have patience. Rent4Ring does not control Nürburgring opening times and cannot guarantee any published times or take responsibility for short notice cancellations. What is the difference between a basic and all-inclusive rental? All-inclusive is including fuel and lap tickets for the public sessions. There is no need to refuel the car before you return. Basic is just for the car. It does not include any tickets, fuel or entry fees. You must refuel the car before you return it. This rate is best for experienced visitors who already have laptickets from a previous visit or a season pass. Our All-Inclusive-Packages are the easiest and most convenient way for your Nurburgring self drive experience. All you have to do is to come to our shop, sign the rental agreement and take the keys for your rental car. We will take care of that as well as for providing the Nordschleife lap tickets included in the chosen package. The prices for all our packages as well as all other rental tariffs are listed here. 60-90 minutes before track/session opens: Arrival at Rent4Ring, completion of paperwork and payment. 30 minutes before track opens: first Briefing begins. If you miss the start, you will have to wait for another briefing at our convenience. You may lose track time. Nürburgring opens: If you've not arrived and not contacted us, we will rent your car to the first person walking through the door. Always keep an eye on the opening times as they can often change with no warning. We don't control the opening times. How do I get to Rent4Ring? We provide a map on our website. We are located in the heart of the Nurburgring: In Nurburg, a bit less than one kilometer away from the main entrance to the Nordschleife (Doettinger Hoehe). Nürburg or Nürnberg? Every month we deal with one or two customers who have gone to Nürnberg (Nuremberg). This is approximately 400kms and 4-hours of driving away from us. Nürburg is a small village with a massive track around it. Nürnberg is a massive city with a small street-circuit built at the old Nazi parade grounds. Don't be confused. Public transportation. The trains will only get you as far as Ahrbruck (from the North) or Mayen (from the East). These stations are still over 20kms away and the bus services are sporadic at best. Ahrbruck is a very small station in a small village and it might be hours before you see a taxi. We always recommend hiring a rental car either from the airport or Köln main station. When should I visit the Nürburgring? Let's be really honest; we know that the Eifel weather can be rubbish. We've seen snow falling in June, we've seen it sunny in December. But there's a normally a pattern, with August being the best month for the weather. April, May and June can all be quite wet with a chance of fog. Same to be said for September and October. From November to March it can snow at any time, or be clear. Or be frozen. The GREEN line is our guess at your chances of having the track open, clear and without closures and too much traffic. The RED line is our best guess at when to visit; an average of the green and yellow lines! Notice that we think the chances of the track being open are around 5% from December to February. The weather being drivable is also very unlikely. That's why we shut-down from December 1st to March 1st every year. If the weather is good enough to drive, the track is normally very quiet in March and November. There are exceptions to the average curve we've imagined above. BIG holidays like Easter and May Bank Holiday will always draw huge numbers. Opening the 'ring for full days of public driving for 2, 3 or even 4 days will pull in lots of visitors and concentrate them into one weekend. Can I take passengers on the Nurburgring? You can take passengers with you on the Nurburgring without registration and without any additional charge. All of our cars have two seats, one driver and one passenger. How do I book extra laps? We don't sell extra laps in advance. If you drive extra laps you will be charged for them when you return the car. On a basic rental you would pay just for the extra distance. With an all-inclusive you will need to pay for the fuel and lap tickets as well. Can I have an instructor or coach ride with me? The best way to experience the Nürburgring is with a professional instructor on the passenger seat. Whether it's your lap #1 or lap #1000, we have instructors available who can help you get the most from your time on the Nordschleife. Typical prices are €149 per hour. Coaching is not always possible during Touristenfahrten though. 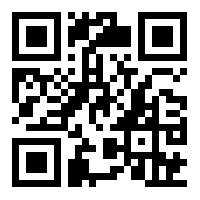 Please give us a call or send an email for further information on prices and available dates. How does the insurance work? How much do I have to pay if I crash? Our rental prices include a comprehensive insurance with an excess. This excess is your liability, your responsibility. The insurance package costs extra, but also covers third party damage. This means that you are liable for all car damages caused on and off the Nurburgring while you rented the car up to this amount. Nürburgring charges and recovery costs are not included in the basic insurance coverage. Furthermore, we reserve the right to ask for this amount up front, as a "kaution" or deposit. Normally this would be held on a credit card while you're driving, with the full amount being refunded when the car is successfully returned. EXAMPLE #1: Driving a Swift, you run wide on a corner, hit the grass and spin into the barrier at low speed. You stop the car, get over the barrier and phone the emergency number provided in the briefing. The marshalls will arrive and assess the situation. If the car is lightly damaged, but they think it's safe to drive, you will be escorted off the circuit by the nearest exit. You will be taken to the office to pay for the marshalls time, €60/hour and any guardrail damage you might have caused. These are your responsibilities. When you return to Rent4Ring, we will work out how much the repair work will cost. The maximum you would pay for the Swift damage would be €6000. EXAMPLE #2: You crash hard driving our Swift, and the damage to the car is €12000. In the accident you also collide with another driver in a Porsche, and his car damages total another €30000. After clean-up, the Nürburgring demand payment of €1800 to replace guardrail hit by your car and cover the costs of marshalling. The recovery truck driver will also require a sum of around €200 to take the car off the track. In this example, first you'd pay the Nürburgring for the guardrail, clean-up and marshalls, then the recovery truck driver for returning your car to Rent4Ring. These are your responsibilities. You do not pay anything to the Porsche driver or for the guardrail hit by the Porsche. When you are recovered to Rent4Ring we will also need the €6000 excess payment. Our company will take care for the rest of the damage to both the Swift and the Porsche. EXAMPLE #3: A BMW driver crashes into you while driving our Swift. Your Swift hits the guardrail, so does his BMW. Both cars need recovery. You believe that the other driver is 100% at fault and you tell the safety workers that. The track will be closed and the Police will be called to any serious accident where the fault is in question. What happens next? The Nürburgring will demand you pay for the guardrail hit by your car. The BMW driver will have to pay for his guardrail. You and the BMW driver will each have to pay for your own recovery. You will need to pay for the damage to the Swift, up to €6000 maximum. If you feel the crash wasn't your fault, we can instruct our insurance company to attempt to recover the costs from the other driver. If the other driver has a German-registered car, and doesn't believe it was his fault, this process would probably result in a court date within the next 6 to 18 months. If you win, and your costs are paid by the BMW driver's insurance, then we will be able to refund your excess and costs. If you lose, there will be no refund and you might be liable for any extra costs incurred in this process. In your own car, or a regular airport rental you probably don't have any insurance at all! Our excesses are lower than our competitors because we put a lot of time and thought in to your safety. Our briefings are extensive and we don't try and 'upsell' you into the fastest car possible. Please check our general business agreement for further information. Can I rent RHD cars at Rent4Ring? Yes, you can! We currently offer one right-hand drive Suzuki Swift Sport Stage 2. What is the minimum age for renting a racecar at Rent4Ring? The minimum age is 21 years. Drivers must have held their license for 2 years. Please note: The german road traffic regulations specify that the minimum age for children sitting on the co-driver seat is 12 years or a minimum hight of 1,50 meters. Our Nordschleife rental cars do not have rear seats. Is it possible to ride with an experienced driver for a fast taxi lap of the ring? We do offer race taxi co-drives during Nurburgring Trackdays and even VLN practice. This is a fantastic opportunity to experience the Nordschleife at race speed with a very experienced driver. Please contact us for available dates, prices and further info. What if the track closes on my rental day? Or I don't drive all of my laps? There are three very different situations to talk about here. The Nordschleife doesn't open that day at all: If you arrive, pay in full and attend the briefing, but the track never opens then we will refund you 100%. This situation happens several times a year, normally due to snow, ice or fog. That's why it's our standard practice not to release the cars to customers until we know the track is open. The Nürburgring changes the opening times: If the track opening hours are changed at short notice, you can ask to downgrade your booking to a package more suitable for the time available. For example, if a half-day session is rescheduled to an evening session on the same day. If you then drive more laps, just pay the extra lap charges at the end, or the original package price. Whichever is best value. You don't drive all of the laps in your package: This used to be a problem, but not anymore. Now we have a new pricing system. You only pay a basic rental rate for each car. This gives you the car for unlimited time, but only the first lap is included in this basic price. You take the car out and drive as many laps as you like, without time limitation as long as the track is open. When you return the car, you will have to pay for the number of laps you have driven. IMPORTANT NOTE: The rental is not time dependent anymore. You book a car always per day, regardless of how long the advertised opening time is. This way, you never loose anything and you will never be stressed while renting our car. Should I rent the fastest car I can afford for my first visit? Some first-time Nürburgring visitors might think that a 136hp Suzuki Swift is far too slow to have any fun on a race track. They're VERY wrong. The Swift is our most popular rental for very good reasons. It's both fast and fun to drive. Experienced 'Ringers and first-timers both love it. On your first 10 laps it doesn't matter if you have 100bhp or 1000bhp; you can only drive as fast as your track knowledge allows. 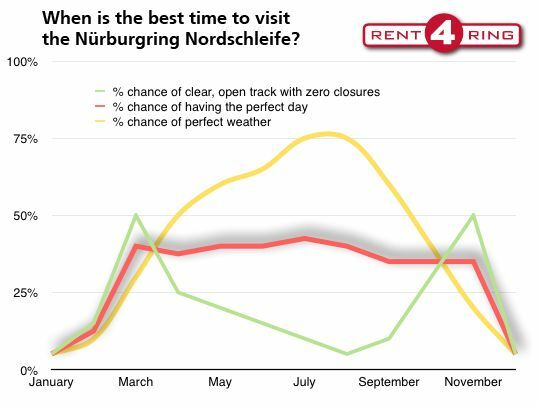 First-time Nürburgring visitors (of all skill levels, including pro racers) often have less fun in the fastest cars and will book the Swifts for their return visit! Professional racers learning the track will normally take a Suzuki Swift for their first 20 to 30 laps, before stepping up to the bigger, faster cars. We're talking about international-level factory drivers who are racing LMP and GT cars. If you're sensible, accept your own limitations and promise not to try and go too fast, then we might consider renting you a faster car for your first laps. But we'll always suggest the Swift first! Unlike some other rental companies (with very high insurance excesses), it's not interesting for us to sell you a car that's too fast for you. Is it required to wear a helmet during Touristenfahrten on the Nurburgring? We provide helmets (with a €50 cash deposit against theft or damage) if you choose to wear one and didn´t bring your own. It is not mandatory to wear a helmet during tourist sessions though. In fact the vast majority of public drivers do not wear a helmet. It´s mandatory for trackdays though. We accept VISA, MasterCard, Maestro and Electronic Cash as well as cash payment. What are the rules for driving the Nürburgring Nordschleife? 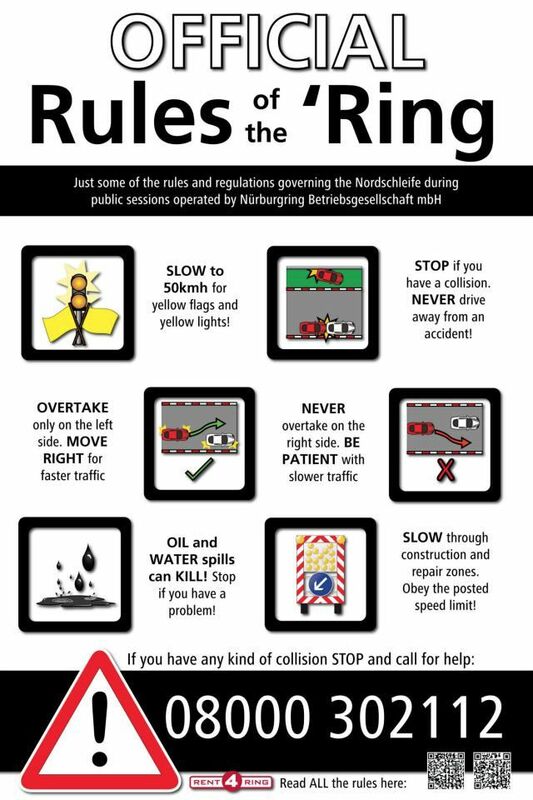 The Nürburgring Nordschleife is a difficult track and it has lots of important rules during the public sessions. Customers driving our rentals will need to complete a 30-minute briefing before they are allowed to drive. During public hours the track is a public road. Overtaking is only on the left side. Slower traffic drives on the right. The racing line is not a priority. Yellow lights mean danger ahead. Yellow flags mean slow to 30kmh. Traffic is often very mixed during Touristenfahrten/tourist sessions. Aside from slower and also very fast cars, you will share the Nurburgring with motor bikes and bus or coaches. If you would like to be on the track with cars only, we recommend that you book on of the various Nurburgring Trackdays. A Trackday usually lasts from morning till late afternoon and allows you to drive as many laps on the Nordschleife as you wish. Check out our Nurburgring Trackday section for dates and more infos. Are video cameras allowed on the Nürburgring Nordschleife? As of 2013, videos cameras have been allowed for personal use. Cameras must be mounted inside the rental car, and we ask that they are mounted safely and professionally! Please bring your own camera! Do I have to pay if the car breaks down, or suffers a technical problem? This is one reason why we choose to run dataloggers on our cars. If the car breaks and it's not the driver's fault, then we will pay for the recovery and find a suitable replacement vehicle with no charges. If it's the driver's fault (for example mis-shifting and over-revving the engine, or damaging the car on a high kerb) then the driver would have to pay to repair the car, up to the maximum liability in the contract. Is there a fine if I accidentally put the wrong gear in and "over-rev" the engine? Yes. We want to make sure, each customer gets a healthy car. The engine in the Swift has prooved to be very solid, but there is a limit somewhere. We have seen RPM´s of 10.000 and higher on a car with a 7000 RPM redline. No wonder, the engine went buzz. We needed to change the engine, but the driver at fault only paid his fine, which is € 150,00 to 300,00 maximum. This way, all our customers can rely on a car that is 100% in shape and will NOT let you down. Let us give you another example: You rent our car, drive off and in you first lap, the engine let´s you down. We can see in the datalogger, you did not make any mistakes, like putting the wrong gear in. You will get a new car right away and you can keep driving without even worring about the broken engine. Important note: If you have no daily experience with manual gearboxes, please don´t try to learn it on a racetrack. We offer also cars with automatic gearboxes, this lets you focus on the road rather than the car itself. Nurburgring, Nordschleife, Green Hell or Nürburgring. Whatever you call this racetrack, we know from experience what you need and we deilver with a passion! All of our cars all fully modified to keep up with the worlds most demanding racetrack. Every vehicle comes with a full insurance with little excess. Every excess can even be reduced further, to suit your needs. Also trackdamage and recovery can be covered.